well. For some of us, our faith journeys began in childhood as a set of beliefs handed to us by a parent, teacher, or pastor. Maybe you developed a framework of faith based on personal experience. Or maybe you had no faith at all. 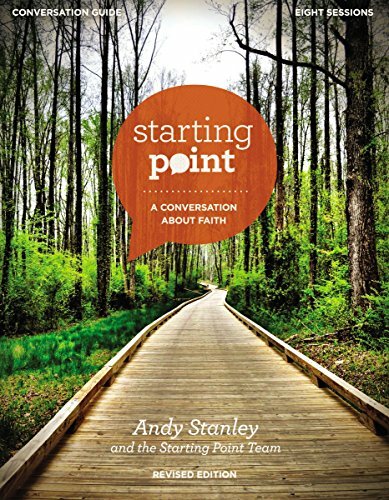 Too often, a faith formed in childhood isn’t strong enough to withstand the pressures of adult life.But what if you could find a new starting point for faith?Welcome to Starting Point – an 8-session small group conversation about faith (DVD/digital video sold separately). Whether you’re new to faith, curious about God, or coming back to church after some time away, it’s a place where your opinions and beliefs are valued, and no question is off limits.During the eight sessions, you will:Use this Starting Point Conversation Guide to reflect on central questions of faith and life.Watch the video component each week in preparation or as part of the discussion.Explore and share what you’re learning with other people in a conversational environment.Come as you are and build relationships with others as you discover your starting point.SESSIONS INCLUDE:StartProblemTrustRulesJesusGraceFaithInvitationDesigned for use with the Starting Point Video Study (sold separately). Andy Stanley is the founder of North Point Ministries, Inc. (NPM). Each Sunday, more than 36,000 people attend one of NPM’s six Atlanta-area churches. To learn more and to access free online resources, visit www.northpointministries.org.